Legs and feet walking through rain puddles during heavy rain, New York City. Slow motion. NEW YORK CITY- July 2014: Heavy rainfall and flooding occurs in Manhattan during the summer. Climate change drives an increase in rainfall across most of the globe as sea levels are predicted to rise. 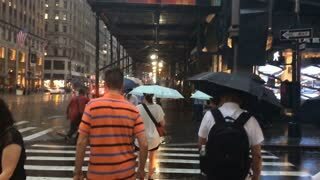 People putting up their umbrellas and walking in heavy rain, New York City. People on the street in Manhattan with umbrella's in heavy rain, New York City. Cinematic slow motion with steam from sewage and pink cast from neon signs. 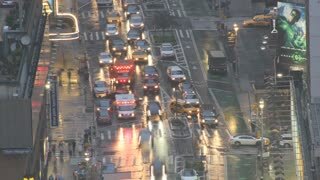 People on the street in heavy rain, NYC. Cars driving through steam from pothole after heavy rain, New York City. 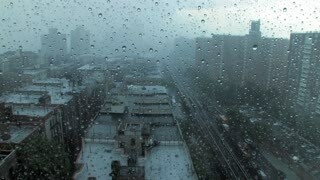 Heavy rain in NYC, people with umbrellas. 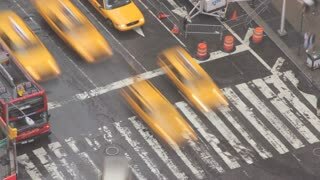 Timelapse daytime dx shot of Times Square in pouring rain in New York City. A New York city street scene in the rain.